North Shore Elder Services "Over the Rainbow Coalition"
Dress in costumes and as characters from books written in the Victorian era, such as Edgar Allen Poe, Charles Dickens, Bram Stoker, Mary Shelley, & Others. Prize for the best male & female costume. This is a 21+ age event. ID's checked. Or click the icon above. An Eventbrite account is not necessary. A small transaction fee may be applied to on-line sales. On-LIne sales deadline 12:00 Noon Friday October 30. "Our Lord & Lady of the Trinacrian Rose Church"
NO TICKETS WILL BE MAILED. ALL NAMES WILL BE HELD AT THE DOOR FOR ADMISSION THE EVENING OF THE EVENT. TICKETS WILL BE SOLD AT THE DOOR BUT WE RECOMMEND ADVANCE SALES TO ASSURE ENTRY. DOOR SALES WILL ACCEPT CASH, CHECK, MONEY ORDER. This is Salem's high tourist Halloween season. Parking will be available but scarce on street at Pickering Wharf. Parking is also available at a reasonable rate at the South Harbor Parking Garage, 10 Congress Street, Salem, at the intersection of Derby Street and Congress Street. 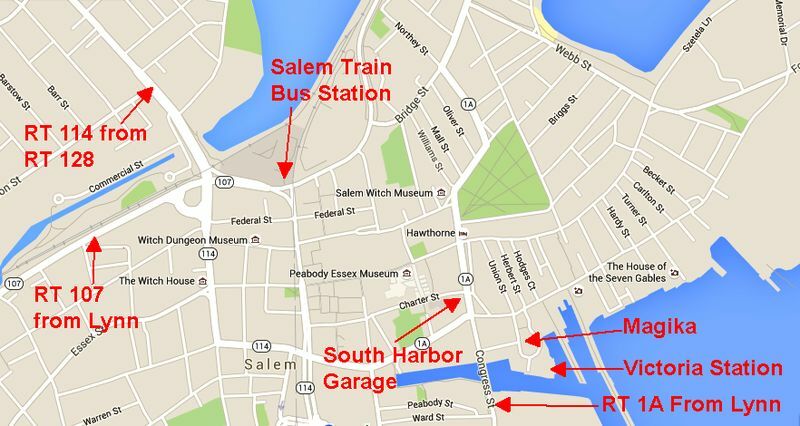 Plan to arrive early as Salem will be full of Halloween revelers and some traffic restrictions will be in place. Come earlier in the day and take in some of Salem's many attractions.